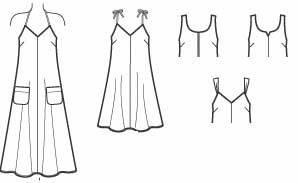 This entry was posted on May 31, 2010 at 8:29 am and is filed under co-ordinates, Eileen Fisher, personal style, speedy sewing, wardrobe planning. You can subscribe via RSS 2.0 feed to this post's comments. Both comments and pings are currently closed. Thanks, Lisanne. 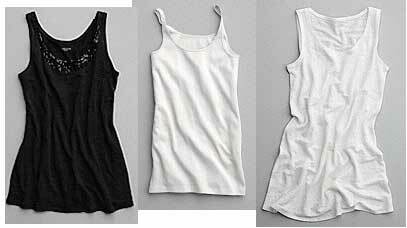 The short-over-long works well for me, and I am intrigued at the cami-dresses. I really, really, like your blog for the way you looks at fashion and translate it into patterns, it’s a great thing that i should do but don’t and it’s really nice to be able to come here and read what you’ve been thinking. BTW, I think if you had a short jacket with shoulders, like the little number shown in your photo, it would help balance your figure, at least, if that croquis you posted is accurate. Have you tried something like that? Thanks Elizabeth – it’s good to have comments from a different perspective! I love fashion magazines and pattern books, though I’m not at all a ‘high fashion’ dresser myself. 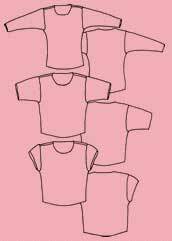 That ‘croquis’ is the generic one for my body shape from an old T&S site. Not accurate for me as I also have sloping shoulders and very high hips. I might try the short ‘jacket’ with cut-on cap sleeves, but not with another strong design line lower on my hips. . . It’s a good style for your square shoulders ? Interesting. I do find that the long over short works best on my Pear shape too. Also darted tops are more flattering for every bosom size. I’m smallish. Always heard that the “larger” bosomed needed darts. I was amazed at how the same basic tank looked 100% better on me by adding the bust dart. 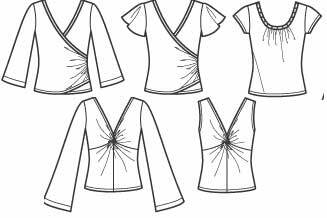 A thing for you to consider the armscye shape for a sleeveless armhole will not be the same as a sleeved. A sleeve can be drafted for every armscye shape, but may not be comfortable when worn. Usually the it needs to be tighter and higher than sleeveless. Just keep that in mind as you do your muslins for the sleeved blouse. Yes, Bev. For me too, a dart definitely makes me look as if I have a bigger front. Thanks for the tip about sleeve fit, another thing to try. . . I love the idea of sewing a wardrobe with pieces that work together effortlessly. Thank you so much for offering so much food for thought – taking time to coordinate shapes, items and colors could really multiply the functionality of each item! Yes Maria – co-ordination is good – but many of us don’t find it at all easy, so I’m trying to think a bit about how to do it ! Elizabeth (ejvc) has a good different perspective on this in a post in her blog. This is a great post. I enjoyed seeing your take on the patterns that would/could be used to create the easy dressing wardrobe. I’m going to go read your post on bottoms now. 🙂 Thanks. Thanks for the link – lots of great information here! Thanks – and good luck for keeping going with some sewing !